A compost heap or pile at the bottom of the garden works well for most gardeners, but the disadvantages of this way of composting is that the compost pile needs careful building, turning and covering from the weather as well as some form of protection from garden pests and rodents which may dismantle the pile looking for food. Also, a compost heap can be unsightly, smelly, be attractive to children to climb on, or require a lot of work to keep it correctly shaped after you have turned it or added fresh materials. One way of overcoming some of the short comings of an open compost heap is to use a Composting Bin, or Composting Container. 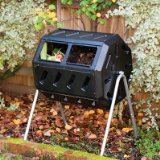 While an open compost heap will eventually decompose providing you with good quality compost, there are several good reasons for using a composting bin rather than a just a heap at the bottom of the garden. They allow you to control air (oxygen), water content and temperature of the decomposing materials inside increasing the rate of composting. Composting Bins do not need to be large expensive containers or a thing of beauty, they can be anything from very simple wooden boxes or plastic dustbin’s to complicated concrete or block structures depending upon your imagination and budget. The simplest composting bin is the plastic dustbin or trash can with a lid. The type of structure or method you choose to make compost is really a matter of personal preference, the space available, how much time and effort do you want to spend. Also the financial costs of a cheap home made or more expensive commercially built container. If you are the do-it-yourself type, you may want to build your own single-bin composting structure using materials like recycled wood, wire mesh, concrete blocks or wooden pallets. Home made composting bins produces compost more slowly than some other commercially available bins because they are used more as an “add-as-you-go” method of composting which starts again every time fresh material is added to the pile. Home made composting containers and bins should have some method of easy opening for turning and retrieving the finished compost which is usually located at the bottom of the pile. The ideal size for a home made composting bin is about one cubic metre (1m3) or one cubic yard (3 feet x 3 feet x 3 feet) as this size allows for easy turning and aeration but any reasonable size will do. Multiple bins or piles are recommended for different stages of the process allowing the compost to be turned from bin to bin. Wooden Pallet Composting Bin – for Aerobic Composting (occurring in the presence of oxygen), a wood pallet composting bin is easy to make and requires just four to six old wooden pallets, and some heavy-duty plastic or wire ties. The pallets can easily be wired or tied together to form a square bin, using one for the base, one for a cover and four to form each of the sides. Using a pallet to form the base of the bin keeps the materials and compost up off the ground allowing for better drainage and air circulation. Construct the wooden bin with removable fronts or sides so that compost can be easily turned with a pitchfork or construct three similar wooden bins next to each other allowing for the pile to be turned into an adjacent empty bin to speed up the decomposition process. Poles & Wire Mesh Composting Bin – an alternative to using wooden pallets is to use wooden poles or sticks with chicken wire wrapped around them to form a circular or square composting bin. This simple, economical bin requires only the length of chicken wire, wire mesh or wire fencing and a few minutes of time to construct. Composting bins made with prefabricated wire mesh or fencing are popular because they are simple to make, easy to move and store and the materials required are generally available from the DIY centre. To turn the composting material in the bin, simply open the bin up, move it to a new location, which can be next to its original location and turn the material back into the wire mess bin. Wire mesh composting bins increase air flow through the material but may need to be covered with plastic to provide protection from animal pests and heavy rains. Barrel or Drum Composting Bin – this is the simplest of all the composting containers as it requires no construction, just buy a dustbin. An enclosed circular 35-to-55 gallon (160-250 Litres) plastic barrel or metal drum with a secure lid is used to generate compost in a relatively short period of time, providing an easy mechanism for turning the compost. To help aerate the compost inside, holes can be punched or drilled into the sides of the drum or barrel to allow for air circulation and drainage of any excess water. Once a week, the drum/barrel can be laid on its side with the lid sealed on, and then rolled around the garden to mix the compost inside and let air into the mixture. As this compost structure is totally enclosed food scraps and composting worms can be added producing good quality compost in only four to six months. Fully enclosed composting drums and barrels can also be used for anaerobic composting (occurring in the absence of oxygen). The composting drum is filled with the required materials, sealed and left to its own devices. Anaerobic composting works best with nitrogen-rich materials such as grass cuttings and green leaves or stem clippings that have a high moisture content. A sealed bin is ideal if you have a large lawn in your back garden to dispose of the grass cuttings. Open Sided Blocks Composting Bin – this type of composting bin is constructed out of concrete breeze or cinder blocks or just bricks without the use of mortar or cement by laying the concrete blocks on top of each other to form a wall. On the ground concrete block construction can be used to build a single bin or a three chambered bin giving more flexibility. A three chambered construction works a little like an assembly line composting station with three batches of compost in different stages of decomposition in each bin. Fresh material is started in the first bin and allowed to decompose before it is turned into the centre bin aerating it as you go, allowing the materials to decompose further. The material in the middle bin is turned into the third and last bin as finished or nearly finished compost. As each de-composting material is turned or moved into the adjacent bin, the first bin becomes empty so new material is started in the first bin each time it is emptied with the completed compost removed from the third bin being used as required. Removable wooden slats or doors on the front of each bin prevents the de-composting material from falling out and offers complete access to the contents for turning. Since this type of construction is generally open to the weather plastic sheeting, old carpet or heavy duty tarpaulin can be used to make tops for protection against heavy rain, animals and pests. Home made composting bins can be a great, cheap and an easy way of starting a composting heap. They do not have to be elaborate or grand constructions as bags, sacks and even a stack of old car tyres can all be used as well as the one’s mentioned above. Building, painting and filling can occur over a weekend with the family and kids involved. If you are not a DIY type of person, don’t have the time to build an outdoor bin or the attractiveness of the composting bin is important to its surroundings, you may want to purchase a manufactured bin. Pre-fabricated, ready built compost bins and drums are available in a wide variety of types, sizes and prices. Many manufactured composting bins are made from recycled plastic, metal or wood and are coloured black or green to blend in with their garden surroundings. It is important to note that while many people prefer to use an enclosure commercially available bin for composting, bins are not essential to the process. Excellent compost can be made in home made open piles. Most commercially available plastic composting bins such as the one on the right, are one-piece bins formed from one or more moulded piece of plastic, complete with a lid. One-piece bins also tend to be more sturdy and are ideal for composting in a small home or apartment. While none of the typical plastic or metal bins on the market are not large enough to produce hot and fast compost, most will produce good quality compost over a longer period of time. The newest design of composting bin now available on the market is the Composting Tumbler. Composting tumblers are basically off the ground rotating barrels which are available in various shapes and sizes. The barrels are designed to easily turn large amounts of compostable materials inside the tumbler producing quick, hot compost in only a few short months. Composting tumblers are more expensive than other types of floor standing bins as they generally consist of a round barrel or drum suspended on a plastic or metal stand. Some more expensive composting tumblers have some form of roller or wheeled base to allow it to be easily turned. Most tumblers have holes in the sides to allow for aeration and a removable lid to allow for the addition or removal of materials. Composting tumblers like the one shown, are easy to set up and fairly easy to rotate, even when full. They are rotated either using a handle or by pushing the drum on a roller wheel base. Most rotating compost drums are batch compost units in which you add all the organic and compostable materials at the same time until the tumbler or drum is completely full, creating a batch of compost. Once the composting tumbler is full it is closed or sealed and left to decompose naturally, turning it on a regular basis (usually two or three times a week) to completely mix the materials inside until you have a finished product. Turning/rotating and mixing the compost in this way helps accelerate the decomposition process decreasing the time to complete the process. Composting Bins are an easy, clean and great way to generate good quality compost for the garden as they save space and look cleaner and neater within the garden area. They help convert waste and rubbish into substances that can improve the soil and provide nutrients to plants. But good quality compost can also be produced without expensive composting bins or tumblers in open piles. Composting bins can be open home made bins that have their top, or sides, or bottom open allowing for air, rain, snow and even pests easy access. Open bins have a number of advantages as they are easier and less expensive to construct, mixing, aerating and adding more compostables or materials to the pile over time is easy. Closed composting bins are sealed from the elements, and commercial bins such as barrels, containers and tumblers are all readily available. Stationery bins sit in one place for the duration of the decomposition and are good for Anaerobic Composting if mixing and aerating the bin is a problem. Multiple composting bins allow compost to be generated at different levels of decomposition as mixing and aerating of the compost can be accomplished by transferring it from one bin to the next. Although expensive, composting tumblers allow for easy mixing and aerating of the materials inside by simply rotating the tumbler. To learn more about how to construct a “Composting Bin”, to obtain more information about the various bins, containers and methods available for composting or to explore the advantages and disadvantages of composting, then Click Here today to get your copy of one of the top “Composting Guides” from Amazon and learn more about the different ways to produce good quality compost in your garden using home made composting bins and containers.